Harvard students call for Winthrop House Dean Ron Sullivan's removal after his decision to defend Harvey Weinstein. More than 50 students called for College administrators to remove Winthrop Faculty Dean Ronald S. Sullivan, Jr., from his post at a rally in front of Massachusetts Hall Monday afternoon. Toting signs that read “Do Your Job” and “Remove Sullivan,” attendees laid out a set of demands for Harvard administrators. They called for Sullivan’s removal, a public apology, and a formal inquiry into faculty deans’ responsibilities to students. 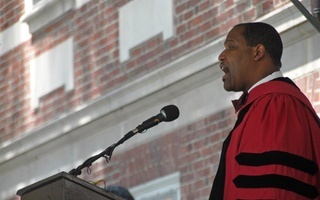 Sullivan, who is also a Harvard Law School professor, currently faces scrutiny over his public defense of two men accused of sexual misconduct. On Jan. 23, the New York Post reported that Sullivan had joined Harvey Weinstein’s legal team as the Hollywood producer faces charges of sexual abuse. 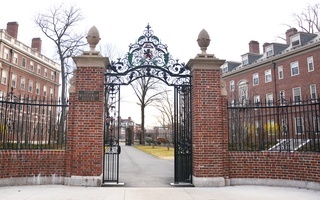 Harvard has opened three Title IX investigations into Fryer based on complaints brought by former female employees who say he harassed them while they worked at the Education Innovation Laboratory, the research group he founded. One of the investigations is ongoing. In an email to Winthrop students about his decision to represent Weinstein, Sullivan wrote that defense lawyers have a duty to represent “unpopular defendants.” He later followed up with another email to Winthrop residents, announcing “processes” that he and Stephanie R. Robinson — his wife and fellow Winthrop Faculty Dean — were implementing after soliciting students feedback following his decision to defend Weinstein. 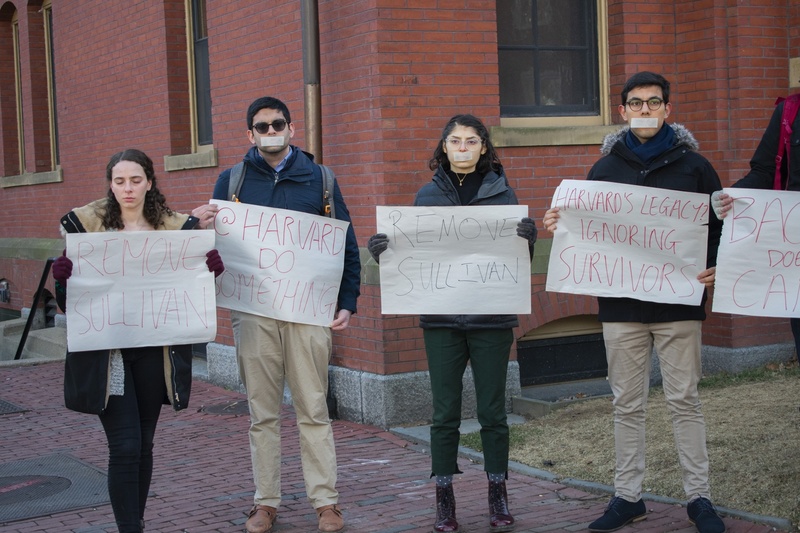 With tape over their mouths in recognition of the #MeToo movement, students demand action from the college following Ron Sullivan's decision to defend Harvey Weinstein. At Monday’s rally, students stood in front of Massachusetts Hall with tape over their mouths. After several minutes of silence, a series of students spoke. Hilda M. Jordan ’19 said Sullivan’s comments on Weinstein and Fryer conflict with his role as a faculty dean. In particular, she pointed to Sullivan’s allegations that witnesses in Harvard’s investigations into Fryer were coached. Winthrop resident Madeleine D. Woods ’19 also called for Sullivan to step down from his post and for administrators to reshape the faculty dean position. Sullivan did not respond to a request for comment. Several College administrators attended the event. 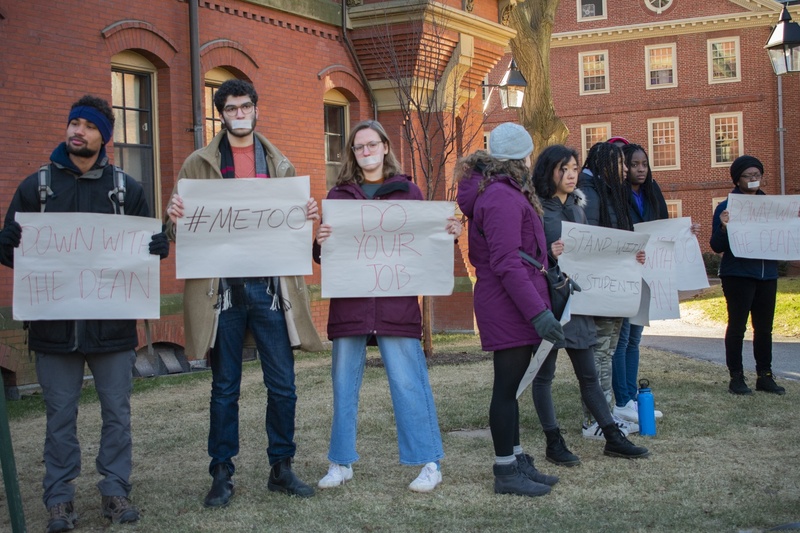 Dean of Students Katherine G. O’Dair and Harvard College Title IX coordinator Emily J. Miller watched the protest and spoke with students afterward. The Office for Sexual Assault Prevention and Response also set up a table with hot chocolate and handouts for attendees. Lowell Faculty Dean Diana L. Eck, who attended the rally, said she agreed with students’ calls for the College to reevaluate the faculty dean position. “We talk a lot about what the role of a resident dean is, what the roles of our tutors are, but the faculty dean role is really important. It’s not nominal. It means a certain amount of hard decision-making on the part of those of us who assume that role,” Eck said. Danukshi "Danu" A.K. Mudannayake ’20, a Crimson Design editor, organized Monday’s demonstration late last week. She also organized a Change.org petition that calls for Sullivan’s removal and had received 164 signatures as of Monday night. “The issue is that he cannot simultaneously hold that role while still having a charade of saying that he can actually protect the integrity of his students,” Mudannayake said in an interview Thursday. At the event’s start and end, Mudannayake repeated the organizers’ demands and criticized administrators’ lack of public response. Dean of the College Rakesh Khurana wrote in an email Monday that support for students in residential spaces is “among the highest of the College’s priorities." Mudannayake, who concentrates in Visual and Environmental Studies, said her aspirations to work in the film industry made Sullivan’s decision to represent Weinstein personal. “I'm a filmmaker, I study film here, and I hope to one day work in the entertainment industry and when the #MeToo thing happened with Harvey Weinstein's case breaking out in the first place, I was deeply shocked and saddened and very afraid,” Mudannayake said. A previous version of this article misspelled Mudannayake's name.